The word pumpkin comes from the Greek word “pepon,” which means large melon. Pumpkins are native to the Americas. More than 1.3 million pounds (589,700 kg) of pumpkins were produced in the U.S. in 2014, according to the U.S. Department of Agriculture. This crop was valued at more than $145 million. A single pumpkin vine can grow up to 30 feet (9 meters) in length and contains both male and female blossoms. The male blossoms attract bees, which are necessary for pollination of the female blooms. 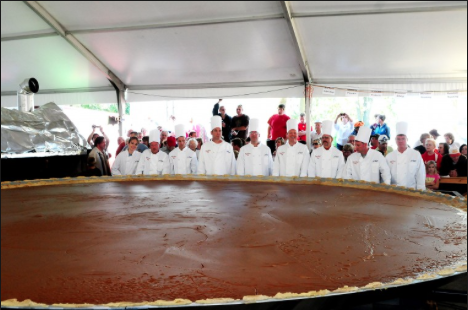 This pumpkin pie broke a world record in 2010 weighing in at 3,699 pounds. (1,678 kilograms). 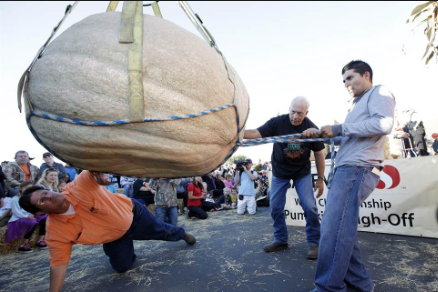 The record for the fastest carving of a jack-o’-lantern was 16.47 seconds and was set in 2013. Starbucks’ pumpkin spice latte was released in fall of 2003. Although it has been a seasonal best seller, it contains no pumpkin. In August 2015, Starbucks announced it will change the recipe to include real pumpkin and no caramel coloring. Pumpkin is low in calories (about 80 for 1 cup puree). It’s a very good source of fiber, vitamins A and C, and the minerals iron, potassium and manganese. Pumpkin seeds are also a source of omega-3 fatty acids. The oil made from pumpkin seeds is possibly effective for symptoms caused by an enlarged prostate (benign prostatic hyperplasia). Pumpkins that are specifically grown for eating are smaller, sweeter and less watery than the larger, stringy pumpkins sold for carving. Pumpkin flowers, leaves and seeds are all edible. Pumpkin is a versatile ingredient. It can be made into a soup, sauce, puree, mash or custard (pie filling). It can be sauteed or roasted. It can be a main ingredient in pancakes, muffins and breads. So as our attention turns to fall — and to pumpkins — why not eat more pumpkin and chew on some of these facts? This post was copied from the Mayo Clinic’s post written by Jennifer K. Nelson, R.D., L.D. 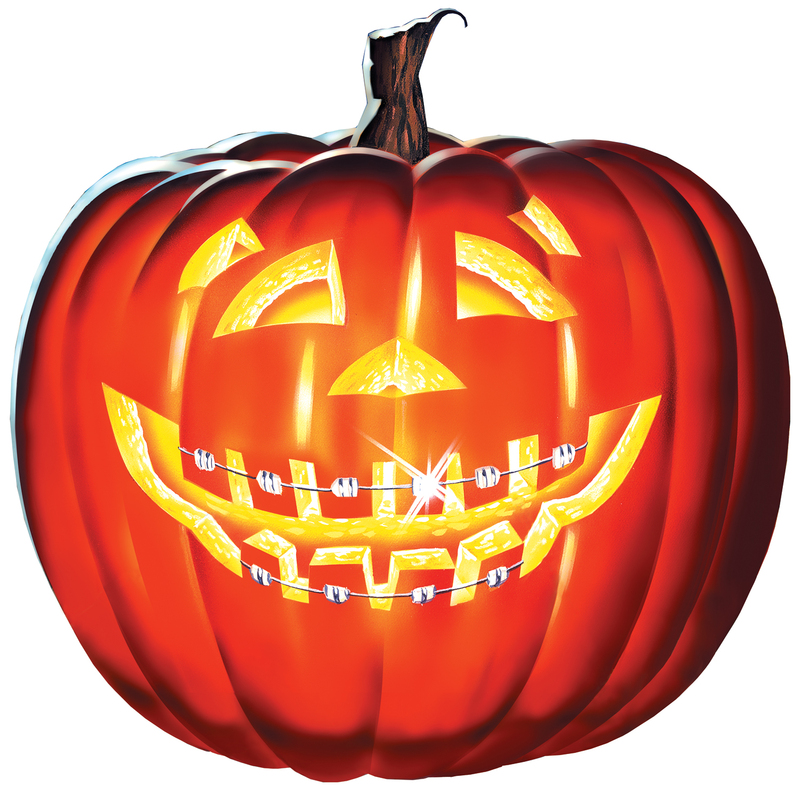 It may seem a little ironic that October is both National Orthodontic Health Month as well as the month when the most candy is consumed. There are some candies that can be a nightmare for someone who has braces, clear aligners or other orthodontic appliances. Those can potentially prolong your treatment so we want the trick-or-treaters some tips. Don’t worry though; some Halloween treats (in moderation) can still be enjoyed when you have braces. And that is not a trick, just a treat! We would like to provide you with some guidelines to help you enjoy the holiday and still be on pace to complete your treatment. Learn about which treats are orthodontic-friendly and which ones you should avoid. Robinson and Ries Orthodontics will buy back that sticky, hard, chewy, braces-breaking candy from all of our patients. Just bring in your loot on November 2nd and 3rd. We will let patients spin a wheel of fortune for cool prizes and cash in exchange for the sugary goods. We will donate the candy to Boys and Girls Town.